We are always looking for passionate, dedicated volunteers to join our team, helping achieve our vision of providing high quality residential aged care. 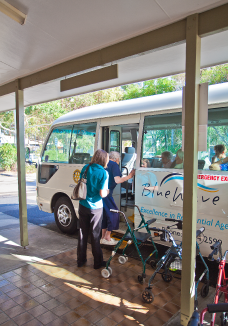 The volunteers at BlueWave Living make an invaluable contribution to our organisation by generously donating their time, skills and expertise to benefit our residents and staff. Whether it’s assisting with resident activities, excursions and day trips or just enjoying a cup of tea and a chat, there is a something to suit everyone. If you are interested in becoming a volunteer of BlueWave Living, please contact us. We are always interested in hearing from friendly and committed locals looking to give back to the community through volunteering.